If it has seven 1 star reviews saying, “This book is terrible, don’t waste your money!” You’ll probably move on. But if it has 5 star book review like, “This has to be the best book of all time!” Well, that’s a different story! So, you’ve used the book reviews. Let me ask you this, have you written one? I bet the majority of you will say no, or maybe that you’ve written one or two. Getting good book reviews can help make the author’s work visible, turning their book into a best seller. I’m going to take a moment and show you how easy it is to write one on Amazon. So, let’s get started! First login to your Amazon account and go to the book you just loved and want to leave a review. 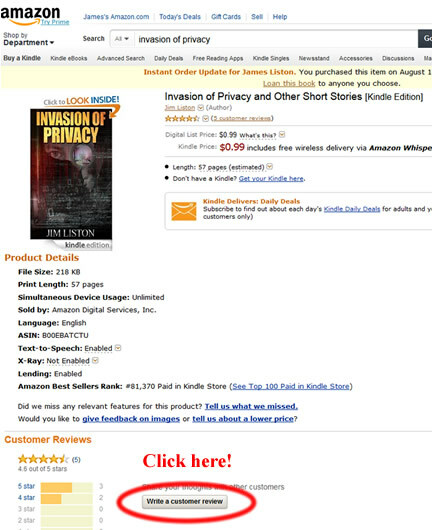 The image below is of my book, “Invasion of Privacy.” (You knew there had to be a plug for it in here somewhere, right?) If you scroll down to the bottom of the picture, you’ll see a button that says, “Write a customer review.” (I added the red oval and “Click Here.”) That will take you to the book review screen. On the review screen, you’ll have 3 steps. It doesn’t have to be brilliant, just a brief description about why you liked it and why you’re glad you’ve read it. It’s not a book report like you had to write in school. Have fun with it! At the bottom of the screen is the “Preview your review” button. Clicking that will let you see how your review will look. If you see something you want to change, then click the “Edit” button and you’ll be able to make your changes. Preview again, and if you’re happy, click “Publish review” and you’re done! Congratulations, you’ve written your first book review! Amazon will send you an email to let you know when your review is live. Your first review will take a while, but once you’ve written one, they are published right away. That’s it. Leave a comment to tell me if you’ve written a book review or just say hi! Thanks for reminding everyone of the importance of writing reviews as readers and as an author, I appreciate the power of reviews to advance book popularity. I know a lot of people that read constantly, but when I ask them if they’ve written any book reviews they usually say no. They use the reviews to decide if they’re going to buy a book or not, but never really thought about who writes them. I think all authors should tell everyone they know to write more reviews. Actually I do not read five star reviews for the most part.. at least at first, I read 3 stars and below. It is important, however the indie world has sullied reviews with thier friends and family leaving awesome five stars with very little merit. I have been struggling for a long time to decide whether or not I am going to stop review for indies, at least for anyone I know. I don’t review a book unless I can give it a good solid three or above, it is a waste of my time as I read at least 100 books a year, if not more (I am actually on 148th book this year). Since I have a book blog I review constantly. AND leaving ratings on Amazon is different. A 3 star on Goodreads usually warrants a 4 star on Amazon since the rating is different for each, same with Barnes and Noble, smashwords and even Library thing. Each star is similar in meaning but Goodreads is actually more distinctive. A 2 star rating means it was OK and that is perfect, but if you rate it a two star you are SLAMMED… write reviews but remember who you are writing them for, other buyers first, not a favor for the friend or to make the authors day. You will do a better thing for the author to write a critical review … notice I did not say positive or negative because that is not what someone should be thinking of. If the book was really that trashy. Write a critical review, don’t slam it! I completely agree with you about writing positive reviews. I read a lot of books too. Though not 148, you’ve got me beat there, and I realize the importance of leaving an honest review. I’ve seen people get 1 star reviews when the reader’s expectations were so high because of all the 5 star reviews. If there would have been less unrealistic reviews they probably wouldn’t have bothered slamming the author. I’m a fan of your site, CabinGoddess.com, and hope you are able to review my new eBook, “Invasion of Privacy and Other Short Stories.” I would love to hear your comments on it. So glad you wrote this. It makes it easier for people. Thanks Cinda. I wish more people would leave reviews so I wanted to make it easier for them. this is very true.these days most people only what to get their books on the market so they try to get many reviews to help them get more popular. which either be good or bad to the buyer. Right, you ask people to leave reviews for you, but if it’s something they don’t like or maybe it isn’t the type of book they’d usually read, you could end up with a 1 star review.